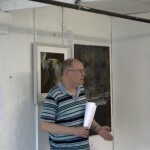 About a year ago, I attended the first Wycombe Arts Forum where I met Peter Keeble of Metroland Poets. We had a little chat, and decided to see if a group of poets could collaborate with a group of artists, and what new poetry and painting would be made. The first step was for the poets to write a poem in response to an image. In January, a group of artists visited the poets’ meeting in Amersham, each taking a sample of their work to see how the poets would respond. 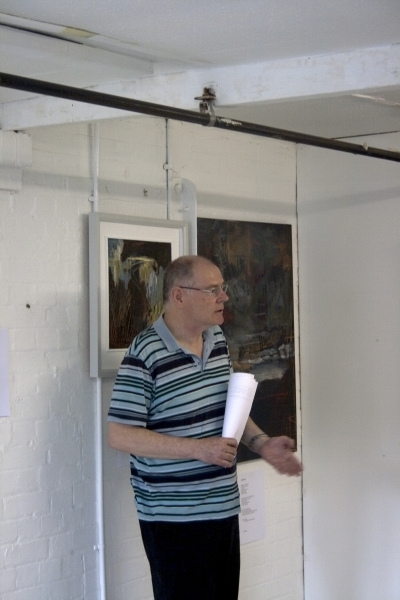 The outcome of that visit was a display of work, at Commercial Square, where new poems were read along-side the original image. In return, the artists were invited to make new work in reply to poems. These we showed last Sunday (11 October). Several artists who missed out this year have expressed interest in participating next year, and I gather there have been similar suggestions by members of Metroland Poets. We hope to repeat the exercise next year. Those artists and poets who did take part this year have been offered a challenge, a bit like a conversation, produce a new work in reply to the response to your original piece.